See in Glossary’s unique identity on the network, and it uses that identity to make the networking system aware of the GameObject. Server Only Tick this checkbox to ensure that Unity only spawns the GameObject on the server, and not on clients. Local Player Authority Tick this checkbox to give authoritative network control of this GameObject to the client that owns it. The player GameObject on that client has authority over it. Other components such as Network Transform use this to determine which client to treat as the source of authority. With the Unity’s server-authoritative networking system, the server must spawn networked GameObjects with network identities, using NetworkServer.Spawn. This automatically creates them on clients that are connected to the server, and assigns them a NetworkInstanceId. See in Glossary that spawn at runtime for the network system to use them. See Object Spawning for more information. See in Glossary (for example, environmental props). Networking GameObjects makes them behave slightly differently, because you need to have them spawn across the network. 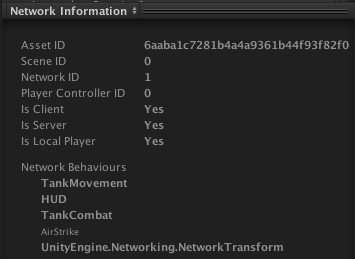 When building your game, Unity disables all Scene-based GameObjects with Network Identity components. When a client connects to the server, the server sends spawn messages to tell the client which Scene GameObjects to enable and what their most up-to-date state information is. This ensures the client’s game does not contain GameObjects at incorrect locations when they start playing, or that Unity does not spawn and immediately destroy GameObjects on connection (for example, if an event removed the GameObject before that client connected). See Networked Scene GameObjects for more information. See in Glossary ID the object has been assigned. This allows you to inspect the information which can be useful for investigation and debugging. The scene ID is valid in all scene objects with a NetworkIdentity component. The network ID is the ID of this particular object instance. There might be multiple objects instantiated from a particular prefab, and the network ID is used to identity which object a network update should be applied to. The asset ID refers to which source asset the object was instantiated from. This is used internally when a particular GameObject prefab is spawned over the network. assetId This identifies the prefab associated with this object (for spawning). See in Glossary on the server. connectionToServer The NetworkConnection associated with this NetworkIdentity. This is only valid for player objects on a local client. hasAuthority True if this object is the authoritative version of the object. This would mean either on a the server for normal objects, or on the client with localPlayerAuthority. isClient True if this object is running on a client. isServer True if this object is running on the server, and has been spawned. See in Glossary A unique identifier for this network session, assigned when spawned. observers The list of client NetworkConnections that are able to see this object. This is read-only. playerControllerId The identifier of the controller associated with this object. Only valid for player objects. SceneId A unique identifier for networked objects in a Scene. This is only populated in play-mode. serverOnly A flag to make this object not be spawned on clients.